Another colourful, tasty and healthy side dish to eat with such as chicken kebabs, herbed chicken, lamb chops or even eat just on its own as a quick lunch. This Beetroot Slaw Recipe is low in fat and only has 1g of sugar, so is right up there at the top in this year’s thinking on Healthy Food. It also looks delicious and with the addition of cashews or salted peanuts and a pinch of chilli and ginger powder it will satisfy your taste buds. This Beetroot Slaw recipe is absolutely delicious, and very healthy. It makes a brilliant Winter side dish to chicken, pork, lamb etc, but could also be eaten in Summer at barbecues with kebabs and eaten on its own. I would play around with it and maybe add some juicy raisins or sultanas, giving it a more Sicilian flavour. Use either the rough grating blade of your food processor or use a medium wide grater or mandolin - you don't want the grated slices to be too thick. Peel and grate both the beetroot and carrot. Tip into a bowl and stir in the sliced spring onions and nuts. Mix the yogurt, honey, chilli and ginger. Serve each portion of the Beetroot Slaw drizzled with a little of your favourite dressing. (My favourite would be a mixture of Olive Oil, Sherry Vinegar and a teaspoon of Wholegrain Mustard). 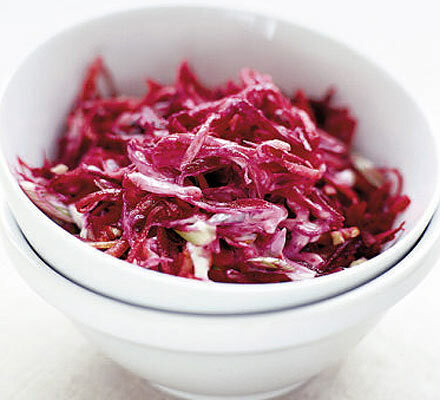 So that’s a delicious Beetroot Slaw recipe to brighten up your Winter or Summer diet. Play around the ingredients and make it your own. Would love to hear any suggestions for these recipes, so if you feel like dropping me a line, please do. The more we share our ideas, the more choices of great dishes we will all have chance to eat. Hope you enjoy it.